Independent travel is for parties of 1 to 14 persons. Caravelle Tours is proud to say that we offer highly personalized independent tours to our clients. You tell us your dream vacation – we will make it happen! Guaranteed to give you the attention you deserve and providing you with professional advice, our team is known for providing excellent customer service. Each client is important to us – you will feel it. If you are looking to book a trip to Italy please let us know what you have in mind by contacting us directly or by filling out our request form. Caravelle Tours is not just selling any tour – we are selling your tours. The variety we offer in hotels, excursions, shore excursions, transfers and other services will make sure to meet your demand – so that there is nothing left to wish for. One of the main features of individual tours is that they are entirely customizable to suit your preferences and needs. Caravelle Tours would like to suggest the following itineraries: you are welcome to follow them to the letter or use them as a starting point to develop your ideal itinerary. Day 1 – VENICE: Travel from your hometown to Venice. Transfer from the airport to the hotel, then enjoy an afternoon at leisure to catch a glimpse of the city. Day 2 – VENICE: Take part in a tour of Venice, including San Marco’s Square and the prestigious Doge’s Palace. In the afternoon, explore on your own. Day 3 – VENICE/FLORENCE: Travel from Venice to Florence. Then join a tour of the city, featuring the Duomo and the Academy of Fine Arts with its famous statue “David” by Michelangelo. Day 4 – FLORENCE: Spend the day discovering more of this Renaissance city’s treasures independently. Day 5 – FLORENCE/ROME: Travel from Florence to Rome. In the afternoon, take part in a tour of Ancient Rome, including the renowned Colosseum and Roman Forum. Day 6 – ROME: Enjoy a tour of the Vatican Museums and the Basilica of St. Peter’s, then visit landmarks such as the Trevi Fountain, the Pantheon and the Spanish Steps. Day 7 – ROME: Transfer to the airport and travel from Rome to your hometown. Day 1 – ROME: Travel from your hometown to Rome. Transfer from the airport to the hotel, then enjoy an afternoon at leisure to catch a glimpse of the city. Day 2 – ROME: Take part in a tour of Ancient Rome, including the renowned Colosseum and Roman Forum. In the afternoon, visit landmarks such as the Trevi Fountain, the Pantheon and the Spanish Steps. Day 3 – ROME/FLORENCE: Enjoy a tour of the Vatican Museums and the Basilica of St. Peter’s, then travel from Rome to Florence. Day 4 – FLORENCE: Join a tour of the city, featuring the Duomo and the Academy of Fine Arts with its famous statue “David” by Michelangelo. Spend the afternoon discovering more of this Renaissance city’s treasures independently. Day 5 – FLORENCE/MILAN: Travel from Florence to Milan. Take advantage of a free afternoon to shop and stroll along the city’s elegant streets. Day 6 – MILAN: Take part in a tour of Milan, including the Duomo, La Scala Opera House and one of the world’s oldest shopping malls, the Galleria Vittorio Emanuele II. Day 7 – MILAN: Transfer to the airport and travel from Milan to your hometown. Day 1 – VENICE: Travel from your hometown to Venice. Transfer from the airport to the hotel, then take part in a tour of the city, including San Marco’s Square and the prestigious Doge’s Palace. Day 2 – VENICE/PORTO VENERE: Further explore Venice independently, then travel to Porto Venere. 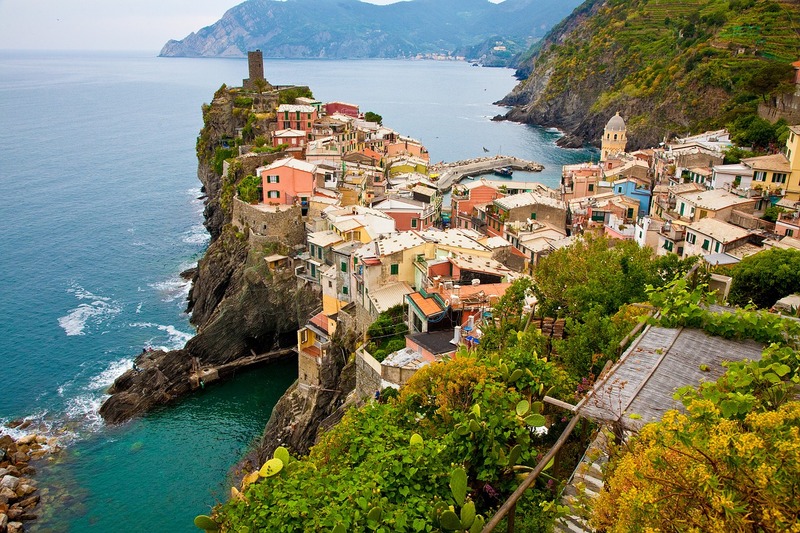 Day 3 – PORTOVENERE/CINQUE TERRE/PORTO VENERE: Enjoy a full-day tour of the stunning terraced landscapes and five cliffside villages – Monterosso al Mare, Vernazza, Corniglia, Manarola and Riomaggiore, known as Cinque Terre. Day 4 – PORTO VENERE/FLORENCE: Travel from Porto Venere Rome to Florence, then join a tour of the city, featuring the Duomo and the Academy of Fine Arts with its famous statue “David” by Michelangelo. Day 5 – FLORENCE/SIENA/ROME: Reach the medieval town of Siena and participate in a tour featuring the Piazza del Campo, where the famous Palio horse race takes place, and the Basilica of San Domenico. Continue to Rome. Day 6 – ROME: Take part in a tour of Ancient Rome, including the renowned Colosseum and Roman Forum. In the afternoon, visit the Vatican Museums and the Basilica of St. Peter’s. Day 1 – VENICE: Travel from your hometown to Venice. Transfer from the airport to the hotel, then take part in a tour of Venice, including San Marco’s Square and the prestigious Doge’s Palace. Day 2 – VENICE/FLORENCE: Travel from Venice to Florence. Then join a tour of the city, featuring the Duomo and the Academy of Fine Arts with its famous statue “David” by Michelangelo. Day 3 – FLORENCE/SAN GIMIGNANO/SIENA/FLORENCE: Enjoy a full-day tour featuring Siena and San Gimignano. In Siena, visit the Piazza del Campo, where the famous Palio horse race takes place, and the Basilica of San Domenico. Continue to San Gimignano, a tiny walled town located on a hill-top, intact through the centuries and famous for its numerous tall towers, frescoes and other valuable works of art. Day 4 – FLORENCE/ASSISI: Reach Assisi and participate in a tour of the town of St. Francis, featuring the Basilica of St. Francis, the Basilica of St. Clare and Piazza del Comune. Day 5 – ASSISI/ROME: Travel from Assisi to Rome. In the afternoon, take part in a tour of Ancient Rome, including the renowned Colosseum and Roman Forum. Day 1 – ROME: Travel from your hometown to Rome. Transfer from the airport to the hotel, then take part in a tour of Ancient Rome, including the renowned Colosseum and Roman Forum. 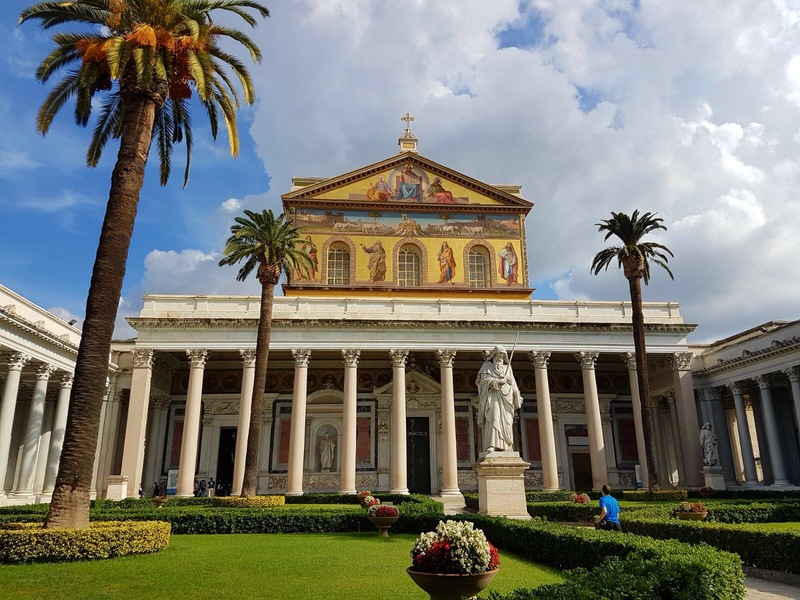 Day 2 – ROME: Enjoy a tour of the Vatican Museums and the Basilica of St. Peter’s, then visit landmarks such as the Trevi Fountain, the Pantheon and the Spanish Steps. Day 3 – ROME/ORVIETO/ASSISI: Reach Orvieto and visit its Cathedral, renowned for its colorful façade. Continue to Assisi, the town of St. Francis. Day 4 – ASSISI: Participate in a tour featuring the Basilica of St. Francis, the Basilica of St. Clare and Piazza del Comune. Spend the afternoon as you please. Day 5 – ASSISI/FLORENCE: Travel from Assisi to Florence. Then join a tour of the city, featuring the Duomo and the Academy of Fine Arts with its famous statue “David” by Michelangelo. Day 6 – FLORENCE/SIENA/SAN GIMIGNANO/FLORENCE: Enjoy a full-day tour featuring Siena and San Gimignano. In Siena, visit the Piazza del Campo, where the famous Palio horse race takes place, and the Basilica of San Domenico. Continue to San Gimignano, a tiny walled town located on a hill-top, intact through the centuries and famous for its numerous tall towers, frescoes and other valuable works of art. 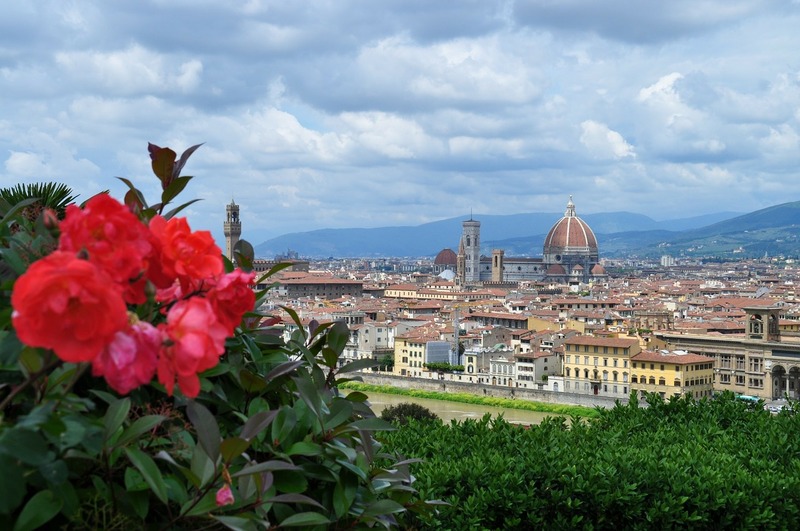 Day 7 – FLORENCE: Transfer to the airport and travel from Florence to your hometown. Day 3 – ROME/SORRENTO: Travel from Rome to Sorrento. Spend an afternoon at leisure to catch a glimpse of the city. 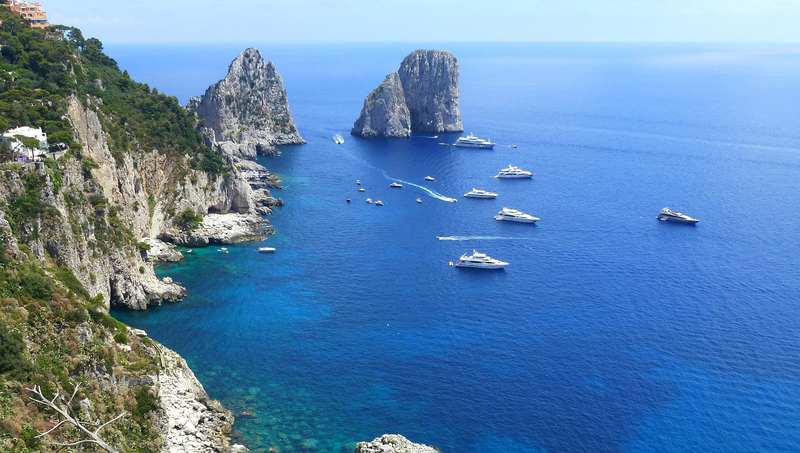 Day 4 – SORRENTO/CAPRI/SORRENTO: Join a full-day excursion to the island of Capri and visit Villa San Michele and the Blue Grotto, well-known for its crystalline blue waters. Day 5 – SORRENTO/AMALFI & POSITANO/SORRENTO: Participate in a full-day excursion along the Amalfi Coast, featuring the romantic and exclusive villages of Amalfi and Positano. Day 6 – SORRENTO/POMPEII/ROME: Reach Pompeii and visit the famous archaeological site destroyed by the eruption of Mount Vesuvius in 79 b.C. Continue to Rome. Day 1 – ROME: Travel from your hometown to Rome. Transfer from the airport to the hotel, adjust to the new time and settle in. Day 3 – ROME: Take part in a tour of Ancient Rome, including the renowned Colosseum and Roman Forum. Spend the afternoon at your leisure. Day 4 – ROME: The day is at your disposal for shopping and sightseeing. Possible excursion to Tivoli, famous for its gardens and marvelous fountains. Day 5 – ROME/SORRENTO: Travel from Rome to Sorrento. Spend an afternoon at leisure to catch a glimpse of the city. Day 6 – SORRENTO: The day is yours to enjoy the town and its charming atmosphere. Day 7 – SORRENTO/CAPRI/SORRENTO: Join a full-day excursion to the island of Capri and visit Villa San Michele and the Blue Grotto, well-known for its crystalline-blue waters. Day 8 – SORRENTO/AMALFI & POSITANO/SORRENTO: Participate in a full-day excursion along the Amalfi Coast, featuring the romantic and exclusive villages of Amalfi and Positano. Day 9 – SORRENTO/POMPEII/ROME: Reach Pompeii and visit the famous archaeological site destroyed by the eruption of Mount Vesuvius in 79 b.C. Continue to Rome. Day 10 – ROME: Transfer to the airport and travel from Rome to your hometown. Day 4 – ROME/FLORENCE: Travel from Rome to Florence. Then join a tour of the city, featuring the Duomo and the Academy of Fine Arts with its famous statue “David” by Michelangelo. Day 5 – FLORENCE: Spend the day discovering more of this Renaissance city’s treasures independently. Day 6 – FLORENCE/VENICE: Travel from Florence to Venice and enjoy an afternoon at leisure to catch a glimpse of the city. Day 7 – VENICE: Take part in a tour of Venice, including San Marco’s Square and the prestigious Doge’s Palace. In the afternoon, explore on your own. Day 8 – VENICE/PADUA/VENICE: Join an excursion to Padua. 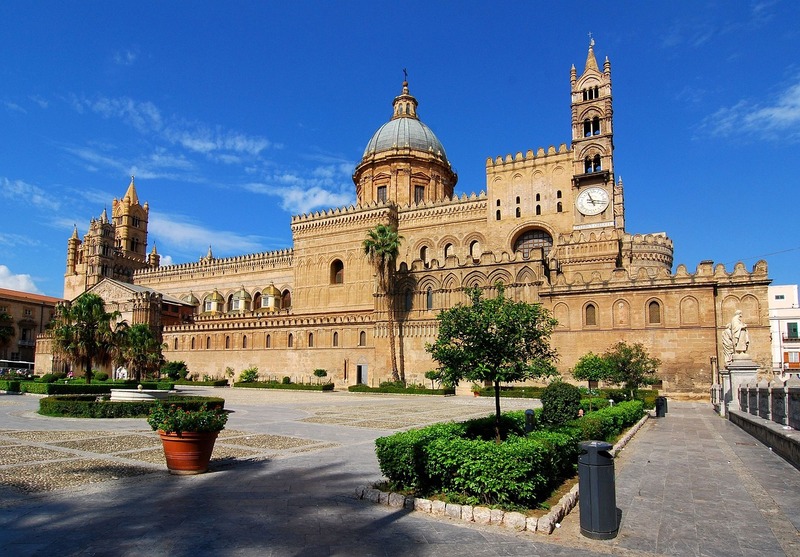 Admire Donatello’s Statue and enjoy a visit of the Church of St. Anthony and his tomb. Day 9 – VENICE/VERONA/VENICE: Participate in an excursion to Verona. Take a look at the Romeo and Juliet’s balcony and stroll in the area of Piazza delle Erbe, the most ancient square of Verona. Day 10 – VENICE: Transfer to the airport and travel from Venice to your hometown. Day 4 – FLORENCE/PISA/FLORENCE: Join a tour of the city, featuring the Duomo and the Academy of Fine Arts with its famous statue “David” by Michelangelo. In the afternoon, reach Pisa and tour the Piazza dei Miracoli with its famous Leaning Tour. Day 5 – FLORENCE/SAN GIMIGNANO/SIENA/FLORENCE: Enjoy a full-day tour featuring Siena and San Gimignano. In Siena, visit the Piazza del Campo, where the famous Palio horse race takes place, and the Basilica of San Domenico. Continue to San Gimignano, a tiny walled town located on a hill-top, intact through the centuries and famous for its numerous tall towers, frescoes and other valuable works of art. Day 6 – FLORENCE/BOLOGNA: Travel to Bologna. Take part in a walking tour and visit the city’s landmarks, including the Fountain of Neptune and the Two Towers. Day 7 – BOLOGNA/MILAN: Travel from Bologna to Milan. Take advantage of a free afternoon to shop and stroll along the city’s elegant streets. Day 8 – MILAN: Take part in a tour of Milan, including the Duomo, La Scala Opera House and one of the world’s oldest shopping malls, the Galleria Vittorio Emanuele II. Day 9 – MILAN/STRESA/MILAN: Enjoy an excursion to the Borromean Islands and marvel at their picturesque setting in the Lake Maggiore. Day 10 – MILAN: Transfer to the airport and travel from Milan to your hometown. Day 5 – ASSISI/FLORENCE: Travel from Assisi to Florence and spend the rest of the day at leisure to catch a glimpse of the city. Day 7 – FLORENCE/PISA/FLORENCE: Join a tour of the city, featuring the Duomo and the Academy of Fine Arts with its famous statue “David” by Michelangelo. In the afternoon, reach Pisa and tour the Piazza dei Miracoli with its famous Leaning Tour. Day 8 – FLORENCE/VENICE: Travel from Florence to Venice and enjoy an afternoon at leisure to catch a glimpse of the city. Day 9 – VENICE: Take part in a tour of Venice, including San Marco’s Square and the prestigious Doge’s Palace. In the afternoon, explore on your own or, possibly, participate in an excursion to Verona and take a look at the Romeo and Juliet’s balcony. Day 9 – SORRENTO/POMPEII/VENICE: Reach Pompeii and visit the famous archaeological site destroyed by the eruption of Mount Vesuvius in 79 b.C. Continue to Venice. Day 10 – VENICE: Take part in a tour of Venice, including San Marco’s Square and the prestigious Doge’s Palace. In the afternoon, explore on your own. Day 11 – VENICE: Take advantage of a free day to shop and sightsee on your own. Possible excursion to the Islands of Murano and Burano. Day 12 – VENICE/PADUA/VENICE: Join an excursion to Padua. Admire Donatello’s Statue and enjoy a visit of the Church of St. Anthony and his tomb. Day 13 – VENICE/VERONA/VENICE: Participate in an excursion to Verona. Take a look at the Romeo and Juliet’s balcony and stroll in the area of Piazza delle Erbe, the most ancient square of Verona. Day 14 – VENICE: Transfer to the airport and travel from Venice to your hometown. Day 4 – ROME/SORRENTO: Travel from Rome to Sorrento. Spend an afternoon at leisure to catch a glimpse of the city. Day 5 – SORRENTO: The day is yours to enjoy the town and its charming atmosphere. Day 6 – SORRENTO/CAPRI/SORRENTO: Join a full-day excursion to the island of Capri and visit Villa San Michele and the Blue Grotto, well-known for its crystalline-blue waters. Day 7 – SORRENTO/AMALFI & POSITANO/SORRENTO: Participate in a full-day excursion along the Amalfi Coast, featuring the romantic and exclusive villages of Amalfi and Positano. Day 8 – SORRENTO/POMPEII/FLORENCE: Reach Pompeii and visit the famous archaeological site destroyed by the eruption of Mount Vesuvius in 79 b.C. Continue to Florence. Day 9 – FLORENCE: Join a tour of the city, featuring the Duomo and the Academy of Fine Arts with its famous statue “David” by Michelangelo. Spend the rest of the day discovering more of this Renaissance city’s treasures independently. Day 10 – FLORENCE/VENICE: Travel from Florence to Venice and enjoy an afternoon at leisure to catch a glimpse of the city. Day 11 – VENICE: Take part in a tour of Venice, including San Marco’s Square and the prestigious Doge’s Palace. In the afternoon, explore on your own. ITINERARY 3, including Rome, Sorrento, Capri, Amalfi, Positano, Pompeii, Florence, Pisa, Siena, San Gimignano and the Chianti region. Day 9 – SORRENTO/POMPEII/FLORENCE: Reach Pompeii and visit the famous archaeological site destroyed by the eruption of Mount Vesuvius in 79 b.C. Continue to Florence. Day 10 – FLORENCE: Join a tour of the city, featuring the Duomo and the Academy of Fine Arts with its famous statue “David” by Michelangelo. Spend the rest of the day discovering more of this Renaissance city’s treasures independently. Day 11 – FLORENCE/PISA/FLORENCE: Spend the morning at your leisure. In the afternoon, reach Pisa and tour the Piazza dei Miracoli with its famous Leaning Tour. Day 12 – FLORENCE/SAN GIMIGNANO/SIENA/FLORENCE: Enjoy a full-day tour featuring Siena and San Gimignano. In Siena, visit the Piazza del Campo, where the famous Palio horse race takes place, and the Basilica of San Domenico. Continue to San Gimignano, a tiny walled town located on a hill-top. Day 13 – FLORENCE/CHIANTI/FLORENCE: Travel into the lush Tuscan countryside, stop in quaint towns such as Greve and choose the winery that inspires you and enjoy Tuscany’s prestigious wines and traditional snacks. Day 14 – FLORENCE: Transfer to the airport and travel from Florence to your hometown. Day 10 – MILAN/VENICE: Travel from Milan to Venice and enjoy an afternoon at leisure to catch a glimpse of the city.